Today in Farina there is little but stone ruins. The nearest shops etc, are in Lyndhurst which is approximately 26 km south of Farina. Lyndhurst is an ideal stopover point for travellers heading 55 km further north to Marree and the start of the Birdsville Track. For the more adventurous, Farina provides a bush camp ground with facilities, adjacent to Farina creek. The grounds are maintained by Kevin and Anne Dawes who are the owners of the present-day Farina station. The camp ground is not far from the town and its historic railway siding. Cost is $5.00 per night per person. Hot shower & toilet facilities are available. For those visiting the site “off season” (when volunteers are not working there), the new volunteer’s section of the park is available. There’s less mowed grass in the volunteer park, but more trees and bushes to hide behind! Located in the centre of Marree’s township. No water is provided. 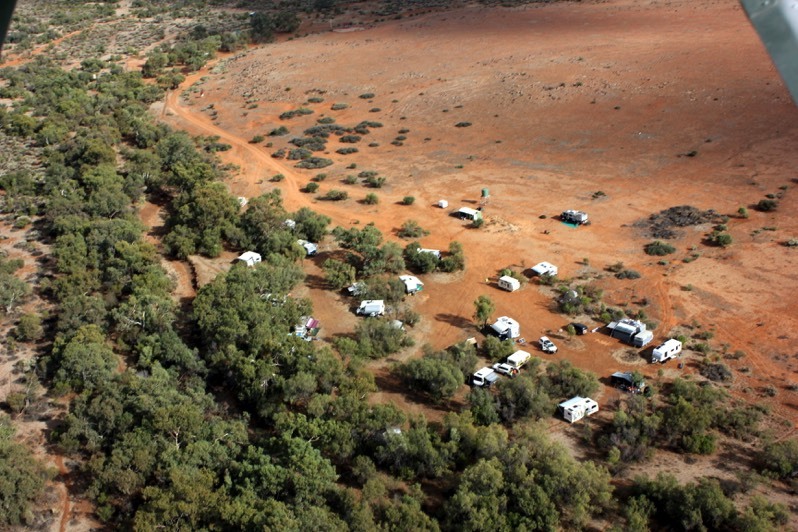 You will find this basic caravan and camping park just South of Marree. No water is provided.